I’m not a big fan of sports drinks like Gatorade and Powerade; before I knew better I thought these were the greatest thing going. I was and still am tiring to get healthy and reduce my blood sugar levels so I stated to really look at what I put into body natural or man made. A big part of that was reading ingredients labels and trying to figure out what all the crap, the names of things I couldn’t pronounce, I was consuming on a daily bases and the amount of carbohydrates and sugars (and sugar like) each product contained. I’m not against them; I’ve just decided their not for me, they don’t fit in to my diet or what I perceive as a healthy choice. I suppose if you are young and doing heavy sports and working out heavily that your body will have no problems with them and to be honest; I do buy the small bottles of Gatorade for my son to drink when he gets a cold and vomits allot. Getting him hydrated and electrolytes back in his system are more of a concern and Gatorade is the only thing he will drink and yes I tried Pediacare. 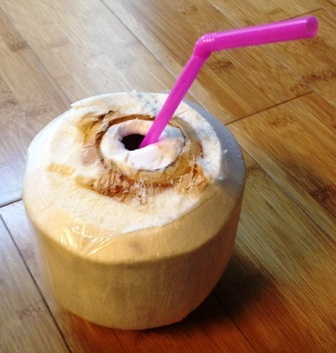 I’ve always loved Coconut water; Buco is what we call it in our family which is what it’s called in the Philippines. Coconut water is by far a better sports drink that either of the aforementioned sports drinks in my humble opinion. I won’t go in to all the specifics; if you want then check out this Coconut water article on WebMD. 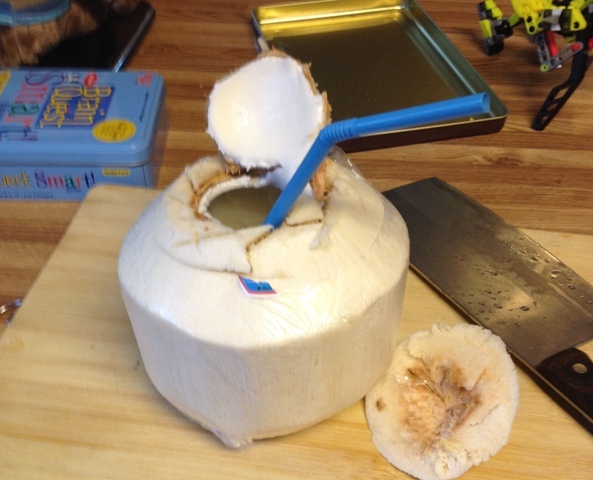 This Blog entry is more on buyer beware then the benefits of Coconut water because as it would seem, and I never really noticed until this week, Coconut water has become somewhat a fad and with this fad has come company after company with a Coconut water offering. 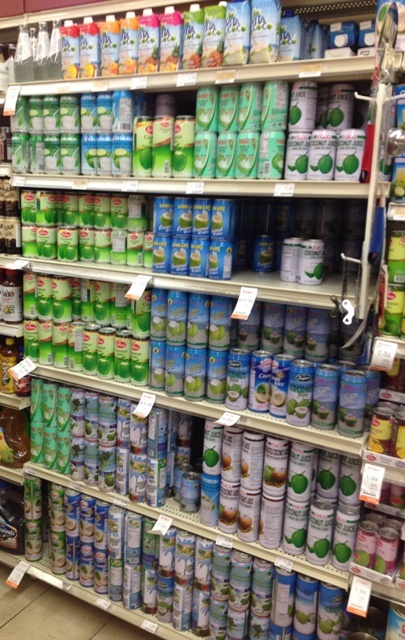 I went to the Asian supermarket yesterday and when I went to the drink section I counted no less than 24 different Coconut offering! Of all of them I only found 6 that didn’t have added sugar and only 4 that were not from concentrate. Most of the store brands like ZICO are from concentrate, why even bother? Others offer … Sugar added for taste consistency – Really? High Fructuous Corn Syrup – YACK! Just buy soda.. 50%, 75%, 80% Juice! Huh? What’s the rest! One even said ALLERGY ADVICE: Contains SULPHURDIOXIDE What the heck?? LOL Why is it these people need to take a great product produced and devolved though nature and screw them up? Of the four I found, the cheapest Long Life 11.1 fl. Oz. was .75 cents on sale plus CRV .5 cents so .80 cents total. The rest were from .99 cents up. I did pick up a few cans of the Long Life brand and two of a brand I found in the frozen juice section just because of my curiosity. 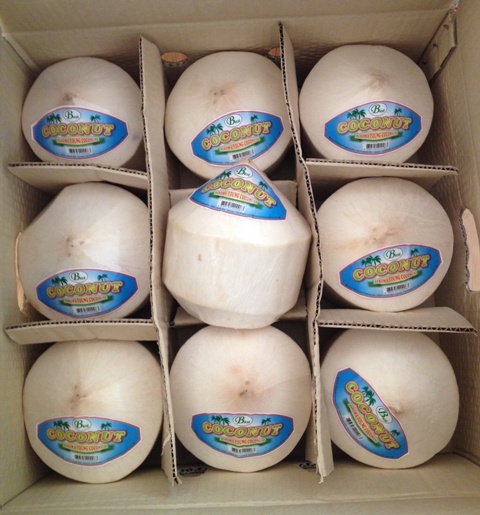 I ended up buying a case of 9 actual Coconuts for $10. 59 which turns out to be $1.18 each. 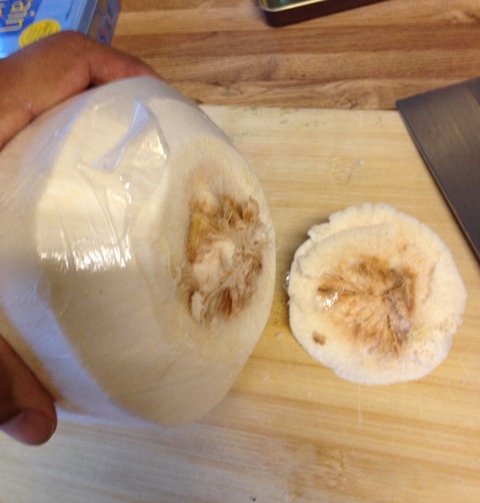 For me this was the beast deal; guaranteed to be 100 percent coconut, no machine or human handling or contamination of the juice and you get the young Coconut (macapuno) as a bonus and of course no CRV. 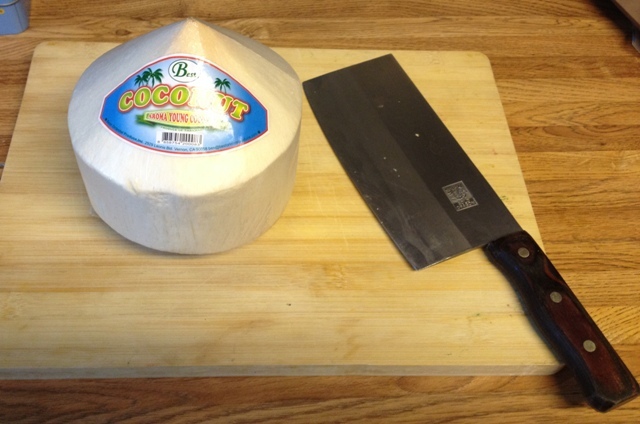 The only problem you have buying real coconuts is they are not a portable drink unless of course you want to carry around a machete or meat cleaver with you. Hence, why I also bought the cans. 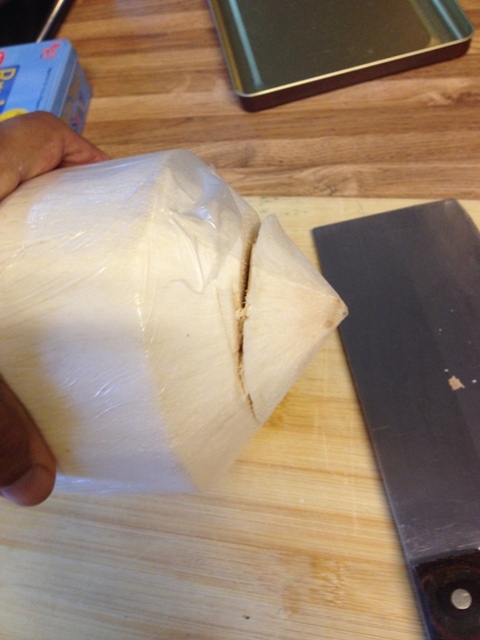 So for you readers who would like to buy and open Coconuts the pre-semi husked ones; here is how to open a coconut. Use a meat cleaver a machete. Even a really heavy BOWIE knife might work. 3. Should look like this once you cut all the way around. 4. Pop off the husk to expose the top of the nut. 5. Using the back end of the cleave or machete. 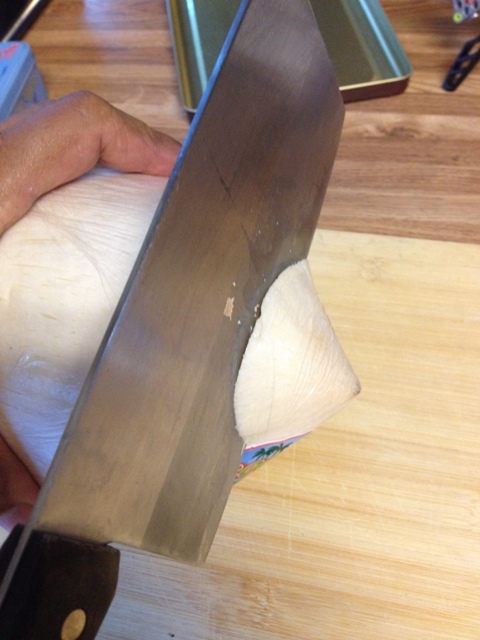 Make small cuts around the nut using a chopping motion. Allot of force is not needed. Once scored all the way around one good hit should open the nut. 6. Pop the top of the nut open. 7. Insert Straw and Enjoy! 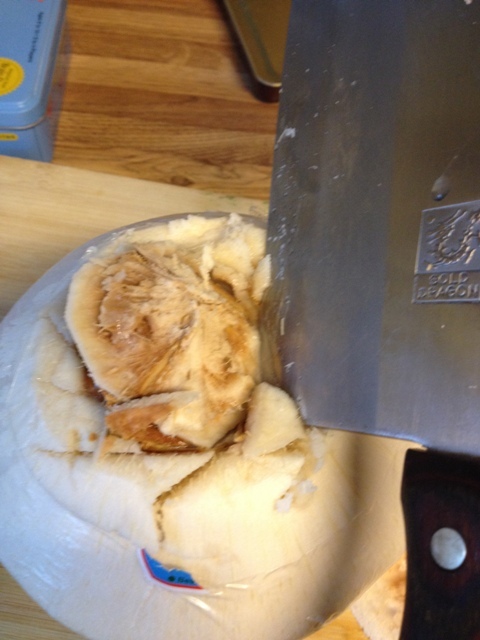 the Coconut meat can be scraped out with a spoon and eaten after you finish the juice. 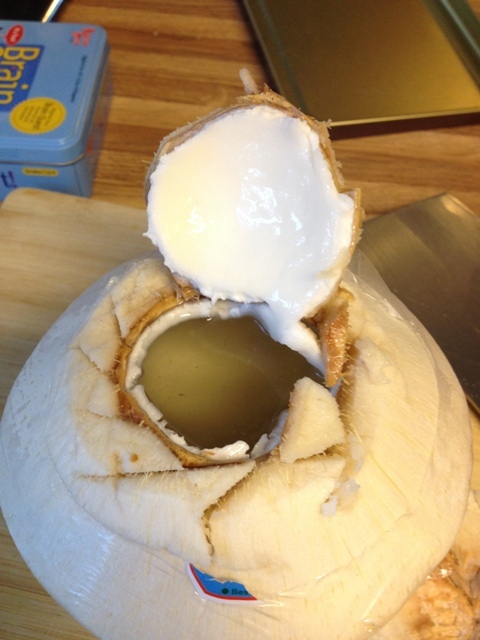 This entry was posted in cooking, Jogging, Reviews, Running, Sports and tagged coconut water, cocount, diet, eatting, electrolytes, gatorade, jogging, powerade, Reviews, running, sports drinks. Bookmark the permalink.